theological virtues – for the love. Can you be virtuous without loving God? How does one become virtuous? The dictionary definition of virtuous is to be morally excellent, righteous, and/or chaste. Can one be a virtuous person without God? According to the Catechism, a virtuous person freely practices the good. Virtues allow a person to perform good acts and give the best of himself (1804). So why believe in God at all if you can be virtuous without Him? Where would children be without the sacrifice of their parents? Over the course of people’s lives, at least one parent made decisions which put the welfare of their children over their own self-interest. But what about parents who only want to be seen as good parents and force their children to do things that serve the selfish pride of the parents? Aren’t these parents merely seeking self-gratification? In some cases, maybe so. But what of a mother, scorned for pregnancy out of wedlock, who selflessly delivers her baby so that he or she may live, and then gives the child to another person to adopt? All the while doing the right thing out of pure goodness…receiving no gratification inwardly or from her peers. Her sacrifice makes her vulnerable. Her actions require inconvenience. She doesn’t have self-interest. Because she cares more for the child than for herself. Her sacrifice does not fit into the mold of the atheist self-interest point of view. Am I still virtuous if my thoughts are unholy? Let’s say a fictional person named Tommy detests homeless people. Perhaps Tommy presumes all homeless choose to be homeless and Tommy secretly disrespects them. He refuses to love them in spite of their flaws. It is even possible that homeless people have been cruel or acted like jerks towards Tommy in the past. What if Tommy, when accompanied by his girlfriend, sees a homeless man on the street, and despite his own resentful thoughts, Tommy decides to give the man a dollar so that Tommy’s girlfriend finds his actions good? Is Tommy doing good? Well, Tommy is acting in self-interest, and it is good to share with the homeless, so an atheist, by definition, would say that Tommy is good. But because Tommy still curses the man and wishes him ill, a Catholic would say that Tommy is not good or virtuous. A Catholic would say Tommy is selfish for only seeking his own gratification, appearing virtuous to his girlfriend, in the donation. To simply care about one’s own self interest is to live a selfish life, not a virtuous one. To pretend otherwise is illogical. After defining human virtues as seen above, the Catechism goes on to explain the role of faith, hope, and love (theological virtues) when utilizing human virtues. We cannot accurately describe the role of a Christian’s virtues without acknowledging the essential three theological virtues. These three virtues take all other virtues and unite them with God. Prudence, temperance, wisdom, etc. are all human virtuous on their own, but misplaced unless utilized with faith, hope, and charity (love) in God. In the example above, had Tommy used his faith in God to see that the homeless person is made in God’s image and been hopeful of salvation for the homeless man, or had loved the homeless man in spite of the man’s flaws, Tommy would have found it impossible to act only in self-interest. He would be acting in great charity to reach out to the homeless man, not for Tommy’s own interest, but for the homeless man’s interest. Charity (love) is the theological virtue by which we love God above all things for his own sake, and our neighbor as ourselves for the love of God (1822). Faith helps us because it is not easy for man, wounded by sin, to maintain moral balance. Christ’s gift of salvation offers us the grace necessary to persevere in the pursuit of the virtues. Everyone should always ask for this grace of light and strength, frequent the sacraments, cooperate with the Holy Spirit, and follow his calls to love what is good and shun evil (1811). Hope is the theological virtue by which we desire the kingdom of heaven and eternal life as our happiness, placing our trust in Christ’s promises and relying not on our own strength, but on the help of the grace of the Holy Spirit (1817). Part two of this post will discuss virtue signaling and the role of one’s self-interest in appearing virtuous. 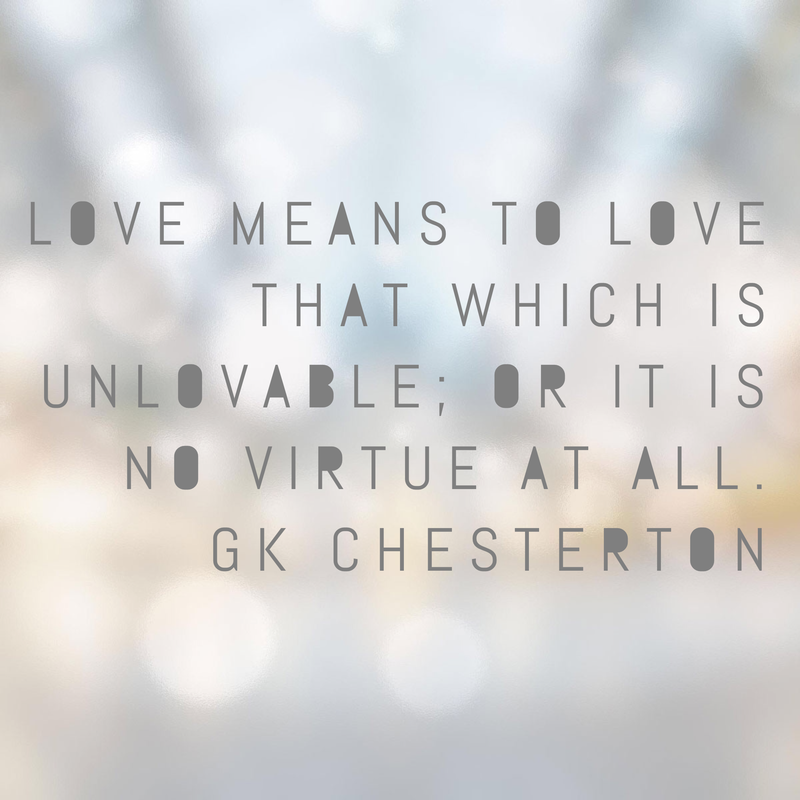 Author ohhforthelove.comPosted on July 2, 2017 July 3, 2017 Categories FaithTags apologetic, atheist, catholic, Christianity, Faith, gk chesterton, God, good, goodness, hope, love, sacrifice, selfish, selfless, serve, theological virtues, Virtue, wisdomLeave a comment on Can you be virtuous without loving God?